Marines in military occupational specialty (MOS) 2336, the explosive ordnance disposal (EOD), probably have one of the most stressful careers possible. And that's saying a lot in a branch that prides itself as "first to fight." Films like The Hurt Locker may have given the layman a basic idea of what an EOD Marine does. 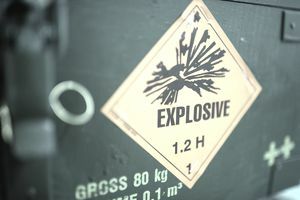 But to be specific, the Marine Corps MOS Manual states that EOD technicians' work involves "locating, accessing, identifying, rendering safe, neutralizing, and disposing of" ordnance, including chemical or nuclear hazards, improvised explosive devices (IEDs), and – well, other things that go "boom." In addition to deploying to foreign battlefields, EOD technicians may also find themselves coordinating with Federal or local agencies when a domestic threat presents itself. It's a high-stakes job where one wrong move could mean losing life or at least a limb. As a result, it's one of the few military careers that allows individuals to resign from the job if they're burnt out. Marine Corps Order (MCO) 3571.2G, Explosive Ordnance Disposal Program, authorizes "voluntary permanent removal" from the MOS "when the Marine makes such a request for personal reasons." Unlike most jobs, recruits can't enlist to join the EOD team out of high school. Only Marines who have at least reached the rank of corporal (E-4) can volunteer for duty, and even then, only the most qualified and motivated will survive the vetting process. Interested Marines begin by submitting themselves for screening (a good career planner should be able to help). Most of the time, Marines are screened in-person by senior EOD personnel to determine if they're suitable to join the MOS. Ultimately, it's a job interview, which means it takes a stellar Marine with the right attitude to make the cut, not just someone who meets the bare minimum requirements. But of course, there are bare minimums that have to be taken into account. First of all, the prospective EOD Marine needs to be a US citizen. Any dual citizenship must be relinquished to qualify. Marines must also possess or qualify for a security clearance. On the Armed Services Vocational Aptitude Battery (ASVAB), a general technical score of 110 or higher is necessary. Most Marines will have already taken the test when they first enlisted, but if their scores weren't up to snuff with their new EOD ambitions there are opportunities to re-take the exam. Marines need to be at the top of their PT game with a first-class physical fitness test score. Normal color vision is a must. Any history of drug use (other than "experimental use of cannabis" before joining the Corps) renders a Marine "not qualified to lateral move into the 2336 MOS," according to MCO 3571.2G. Ideally, training starts as soon as the Marine Corps gives an EOD applicant the green light. As soon as possible, qualified Marines are transferred to an EOD unit and begin learning on-the-job under the supervision of experts, until a seat opens up at formal training. Formal training takes place at the Naval School for Explosive Ordnance Disposal (NAVSCOLEOD) at Eglin Air Force Base, Florida. Don't let the name fool you: NAVSCOLEOD is overseen by the Navy, but students and instructors hail from all four branches of the military, as well as some Department of Defense civilians. According to Eglin's NAVSCOLEOD Fact Sheet, for Marines "the school consists of 143 academic training days" (not including weekends or holidays) and "is broken down into 10 separate training divisions: CORE, Demolition, Tools and Methods, Biological and Chemical, Ground Ordnance, Air Ordnance, Improvised Explosive Devices, Nuclear Ordnance, WMD and Underwater." Even after finishing school, continuing education is vital to EOD technicians. Every 2336 Marine has to be re-screened annually to make sure they're receiving continued refresher training and maintaining their core competencies. EOD Marines may apply training and experience toward a journeyman apprenticeship as an ordnance artificer through the United Services Military Apprenticeship Program. And of course, Marines who complete EOD training and earn the MOS are qualified to wear the EOD badge on their uniforms to signify their intense training and commitment.